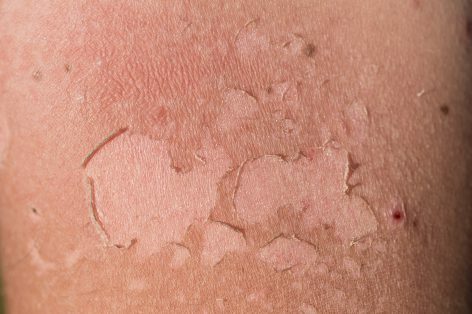 Almost everyone, regardless of skin color, has experienced the discomfort of sunburn, said Kevin M. Wong, MD, Westmoreland Family Medicine – UPMC. Itchy, peeling skin that’s sensitive to touch is never fun during the summer months. Yet it’s often difficult to judge when exactly sun exposure can be serious. How do we tell the difference between sunburn from sun poisoning? Is It Sunburn or Sun Poisoning? Sometimes it’s difficult to tell the difference between sunburn and sun poisoning. While a sunburn is redness of the skin that will go away after a few days, sun poisoning is a more serious irritation that manifests in hives and blisters. Some people call these hives a “sun rash,” a rash on a sunburn. A severe sunburn may lead to flu-like symptoms and other symptoms like sun poisoning. However, a severe sunburn does not result in rashes or hives. Sun poisoning, unlike a sunburn, is your skin’s allergic reaction to excessive amounts of UV rays. It happens when you’ve been out in the sun for long periods of time without proper protection. It often manifests in blisters or a sun rash, although severity depends on length of exposure. If you’re experiencing any of these symptoms, move to a cool, shaded area out of direct sunlight. Find a UPMC primary care physician. Call 1-855-676-UPMCPCP (8762) or visit UPMC Find a Doctor. For more information, visit the UPMC Primary Care website. If your symptoms include severe nausea, fever, or dizziness, call a doctor for advice. The best way to avoid sunburn or sun poisoning is prevention. If you’re planning on being out in the sun for long periods, cover up with long sleeves or a “broad-brimmed” hat, adds Dr. Wong. Wear broad-spectrum sunscreen of at least 30 SPF to block any harmful UV rays. When using sunscreen, apply 15 to 30 minutes before sun exposure and every two hours afterward. “Remember to reapply after long exposure or getting wet,” says Dr. Wong. Swimming and sweating can wash away your skin’s protection. Lastly, don’t depend on sunscreen and other protection to block all sun. If you begin burning or if your skin is red, bumpy, or irritated from exposure, move to a shaded area. Taking good care of your skin can help prevent melanoma and other skin cancers.